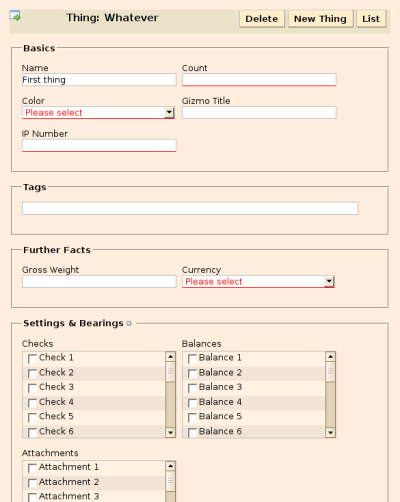 Make your layout look good a different screen and font sizes. 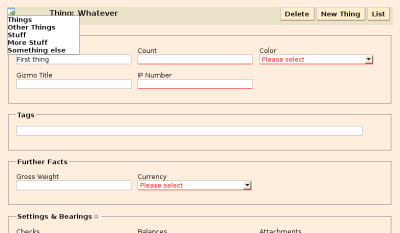 Here’s what the form example (example 1) is supposed to look like. At 1024 x 768 pixels, the navigation links and Save button are positioned fixed in a column to the left. 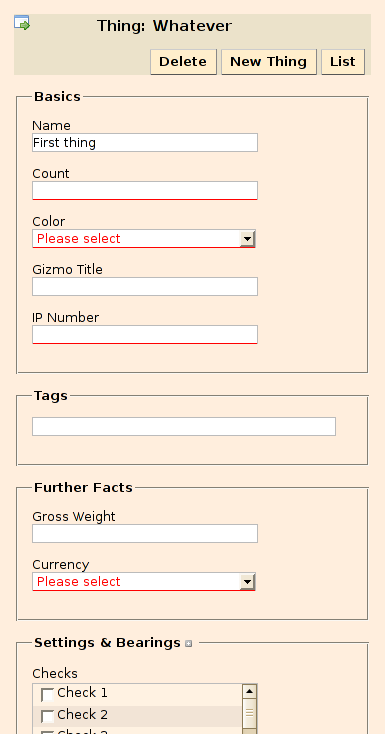 At 800 x 600 pixels, the navigation links are only shown on hover over the icon in the top-left corner; the Save button is tucked under the form itself. Include the scripts in your page. Most likely, the default size thresholds set in layout.js won’t fit your needs. 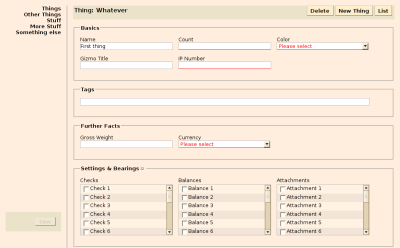 See the file itself for how to set them to different values. (Re-)Write your stylesheets so that they make use of the size information. As an example, here’s the CSS I use for styling the navigation list on the two example pages. I’ve looked at quite a lot of examples of form layout over the past two years. Invariably the demonstrations looked very pretty and were pretty primitive. 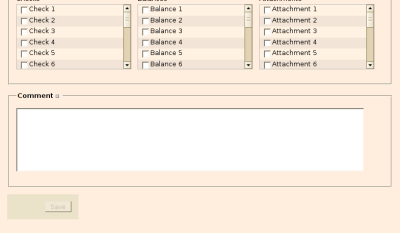 Usually, all the input elements are lined up in a single column; labels are either stuck on top of the inputs or prepended to them. This is all well for simple forms or a succession of forms chained together in wizard-style. It is less appealing for web-based applications targetted at proficient users who interact with them frequently. Tables only where they are semantically meaningful. As much independence as possible from specific window or font sizes. Efficient use of available space. Horizontal and vertical alignment to columns. For those with impaired browsers, here’s what it looks like at various widths. The relevant part of the boilerplate.css stylesheet isn’t even overly long.